Chief selectees stand for a photo with other Chief Master Sergeants from both Luke Air Force Base, Ariz., and around the Air Force during the Luke Chief Recognition Ceremony, March 3, 2018. Chief Master Sgt. Juliet Gudgel, command chief of the Air Education and Training Command, fifth from left, was the guest speaker at the ceremony. Six Airmen were recognized for their promotion to chief master sergeant during the Chief Master Sergeant Recognition Ceremony which took place at Luke Air Force Base, March 3, 2018. Senior Master Sgts. Gabriel Flagg, 56th Maintenance Group Armament Flight chief, Marty Marshall, 56th Force Support Squadron superintendent, Carlos Pubillones, 56th Logistics Readiness Squadron Fuels Management superintendent, and Terry Jo Reppe, 607th Air Control Operations superintendent; and Chief Master Sgts. Daniel Gregory, 56th Maintenance Group Weapons superintendent, and Adam Rising, 550th Fighter Squadron superintendent, were all recognized for promoting or being selected for promotion to chief master sergeant. 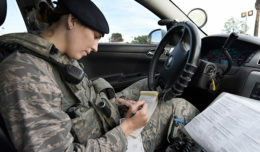 Being the highest enlisted rank in the Air Force, chiefs typically manage the entire enlisted structure of units at the squadron level and higher. The responsibilities entrusted to chiefs are significant and reserved only for the top one percent of the enlisted force. 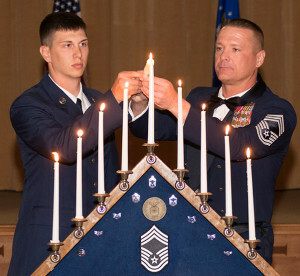 An Airman Basic and a chief master sergeant light the final candle on the ceremonial candelabrum during the Chief Recognition Ceremony at Luke Air Force Base, Ariz., March 3, 2018. The candles represented each of the nine enlisted ranks that an Airman must pass through before reaching chief. 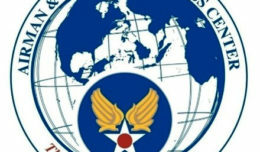 For this reason, achieving the rank of chief is considered one of the highest honors in the Air Force. The ceremony honored the selectees and chiefs by awarding each one with placards in front of a crowd composed of their families, friends, and senior wing, major command, and Air Force leadership. Attendees included Chief Master Sgt. David Brown, command chief of the 19th Air Force, and Chief Master Sgt. Juliet Gudgel, command chief of the Air Education and Training Command, who was the guest speaker. The ceremony concluded with an address from Col. Michael Richardson, 56th Fighter Wing vice commander, and remarks from the selectees. Outside of a general tone of thankfulness to family, friends and mentors, each member expressed their eagerness to step into their role in building the future of airpower.